It’s no secret that smart phones and tablets are flooding the consumer marketplace, so it should be no surprise that visitors to a site such as BoatTrader.com are increasingly arriving there via such devices. We set up a mobile site (m.boattrader.com) two years ago and automatically redirect browsers on mobile devices to that site for its better experience on smaller screens. Growth in visits to the site has been strong, but recent increases have been remarkable — 1.9 million total unique visitors from January to May 2012, up 159 percent from 700,000 in the same period in 2011. If this growth rate continues through June, mobile visits to BoatTrader.com for the year’s first half will easily exceed the 2.2 million for all of 2011. By the end of the year the number could be well past 5 million. Of special note is that overall visitor traffic to Boat Trader listings has grown by double-digit percentages in 2012 in every month except January. The lion’s share of the increase has been attributable to mobile gains. 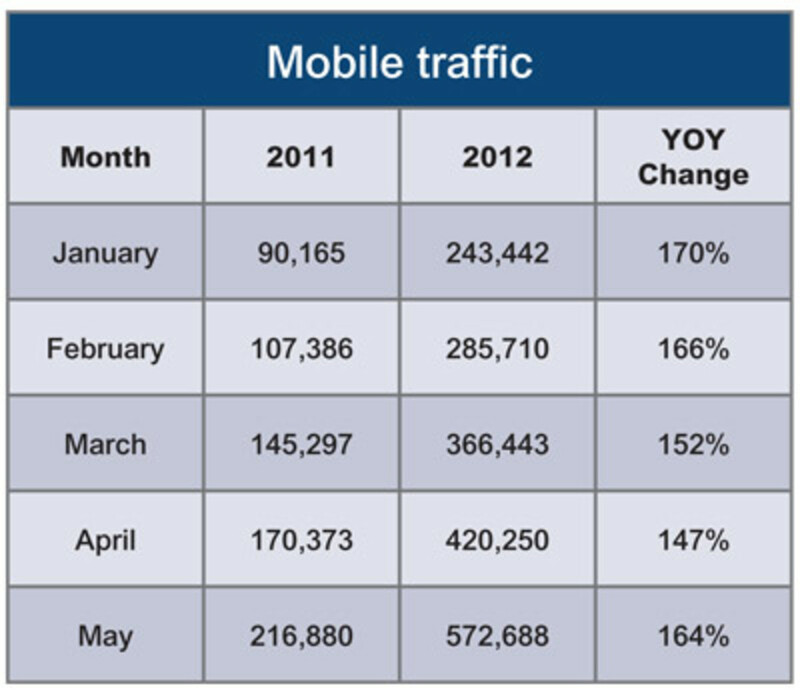 A year ago, mobile traffic was normally less than 10 percent of total monthly traffic. In 2012, it’s typically been greater than 20 percent. In May, 2.4 million unique visitors reached the main BoatTrader.com site or m.boattrader.com, a higher total than in any month in 2011. We don’t understand every facet of these traffic increases by any means, but we have to conclude that mobile devices now make Boat Trader accessible from almost anywhere that a desktop or laptop computer remains inconvenient to use.